Before I had the chance to correct him on either the nationality or code of football, he bent over at the knees, punched his chest, grunted “Ka mate, ka mate!” and gave me his own personal interpretation of the famous Maori war cry right there on the Crescent Street sidewalk. I couldn’t believe how quickly our conversation had escalated! He finished his Haka demonstration and went on to ask if I’d like to see a poem he wrote. 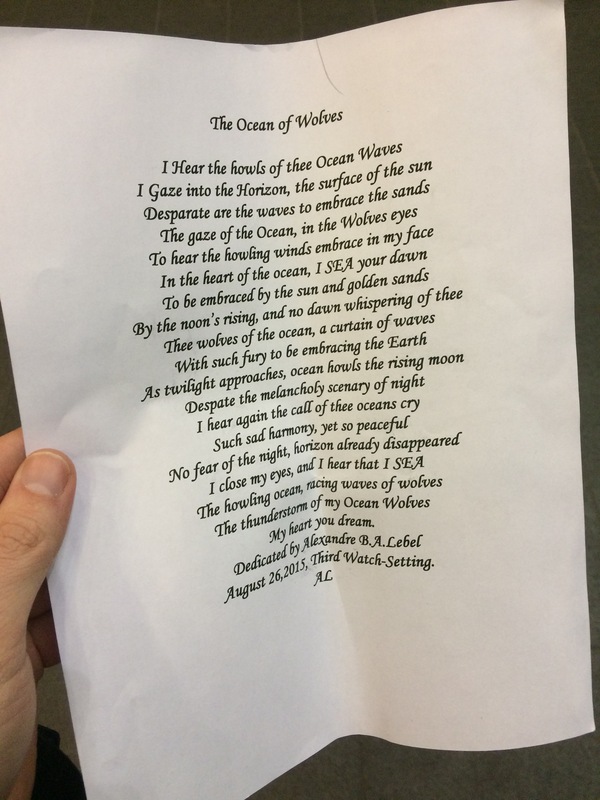 He handed me a sheet of paper with a piece he’d penned called “The Ocean of Wolves”. And with that, he wished me a good night before heading off up the street – the total opposite direction to Thursday’s. So, Alexandre B. A. Lebel of Montreal: if you ever happen to Google your own name and stumble upon this post, please know that I have your poem pinned up at my desk at work. It always makes me smile to glance over it and recall the brief but hilarious encounter we had on the street that evening. I hope you made it to Thursday’s eventually. Thanks for the laugh! This entry was posted on Saturday, February 6th, 2016 at 11:37 pm	and is filed under Reflections, Weird. You can follow any responses to this entry through the RSS 2.0 feed. You can skip to the end and leave a response. Pinging is currently not allowed.